We present our collection of high quality tote bags like canvas tote bags, cotton bags, shopping bags and promotional bags. Made of quality material, our range of tote bags are available in various colors, designs, shades and patterns and offer effective advertising. These shopping tote bags, mini bags and canvas bags are ideal for mall shops, special events and exhibitions. Tote Bags are very useful for promotional views. With the backing up of our diligent designers, we are able to deliver an unparalleled range of Non Woven Canvas Bags. These non woven canvas/tote bags offered by us are applauded among the clients, owing to their durability, liquid resisting and dehumidifying nature. This range is known for finding maximum utility in storing, carrying and gift packing requirements of our clients. Material : 70 GSM Non woven polyproplene material. Colour : Natural / Black / Navy or any custom colour possible. We are the exporter of Non Woven Bags. Owing to the rich experience and competent team of diligent personnel, we are dispatching a supreme range of GOTS Certified Organic Canvas Bags. These canvas bags offered by us are appreciated among the clients, soft textured features and durability. Along with this, the offered range is customized as per the diverse requirements of clients. 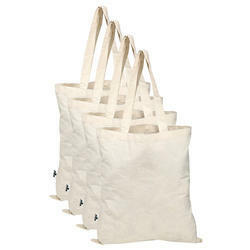 We are the exporter of Organic Canvas Bags. Our firm ensures to meet the diverse requirements of clients, by offering a superior range of Economy Bag (Natural). These economy bag (natural) offered by us are designed using 100% cottons and is ensures to be in compliance with the international quality standards. In addition to this, the offered range is quite demanded in grocery shopping, to carry schoolbooks and just as everyday accessories. 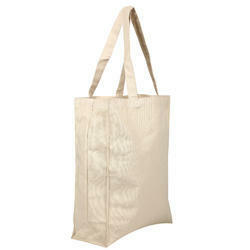 Material : 5oz cotton tote bags with weave handle. 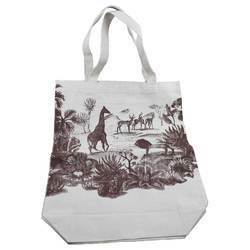 We are offering a superior range of Printed Canvas Bags. These color canvas bags offered by us are appreciated among the clients, owing to their printing and mat-finish lamination. This range of canvas bags is available in different sizes and thickness in accordance with the emerging demands of clients. These two color bags are admired in the market among the clients for their beautiful patterns, unique designs and longer service life. Material : 10oz cotton canvas . Colour : Natural / Black, Natural / Navy, Natural / Red or any custom colour possible. 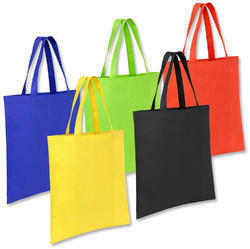 We are the manufacturer and exporter of Color Canvas Bags.